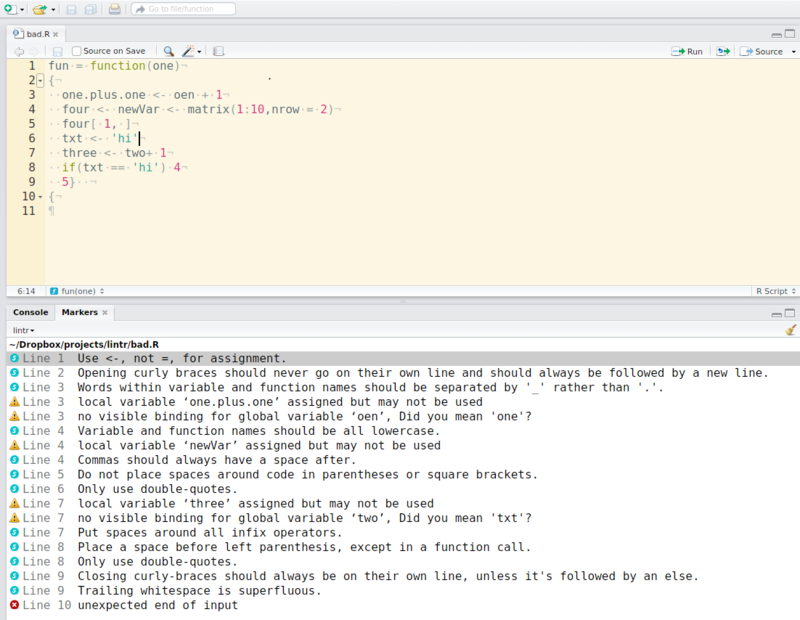 lintr lints are automatically displayed in the RStudio Marker pane, Rstudio versions (> v0.99.206). object_usage_linter: checks that closures have the proper usage using codetools::checkUsage(). Note this runs base::eval() on the code, so do not use with untrusted code. absolute_paths_linter: checks that no absolute paths are used. camel_case_linter: check that function and variable names are not camelCase. 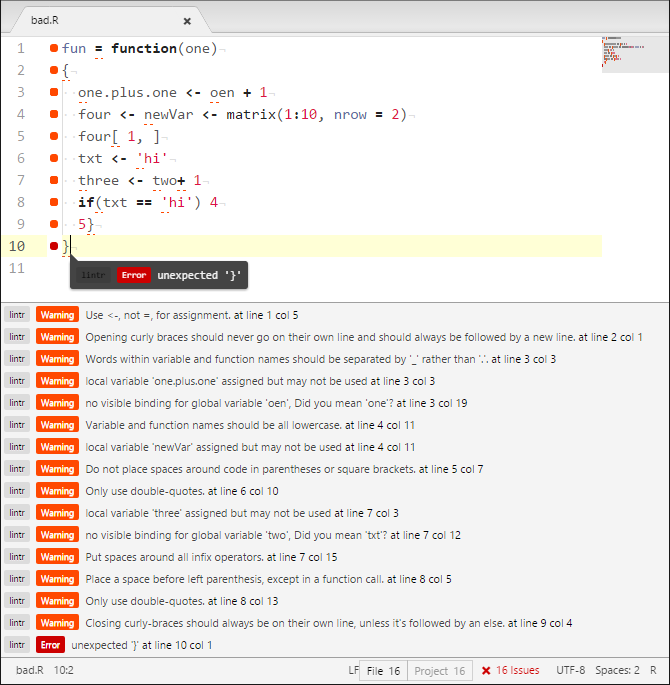 snake_case_linter: check that function and variable names are not snake_case. multiple_dots_linter: check that function and variable names are separated by _ rather than ..
single_quotes_linter: checks that only single quotes are used to delimit string contestants. In both cases the lintr-bot will add comments to the commit or pull request with the lints found and they will also be printed on Travis-CI or Wercker. If you want to disable the commenting you can set the environment variable LINTR_COMMENT_BOT=false. Fix tests to work with upcoming testthat release. expect_lint_free() now is always skipped on CRAN. This is necessary because the non-binary R source may not be available when running tests on CRAN, and those tests may not be run in the package directory. infix_spaces_linter now properly checks = in named arguments. (#130, @saurfang). commas_linter now properly recognizes lints when preceded by a blank line and points to the missing space rather than the comma (#111, #129, @saurfang). expect_lint_free expectation can be added to testthat unit tests. Emacs and Sublime Text 3 plugins now available from their respective package repositories. allow lintr customization per project using .lintr config files. use globalenv() instead of baseenv() for default parent environment so that methods will be included.